Large steam and gas turbine rotor disks require spin testing to assure mechanical reliability at the high forces experienced during full speed operation. This testing is usually conducted in a large vacuum chamber to minimize the required power to drive the rotor. 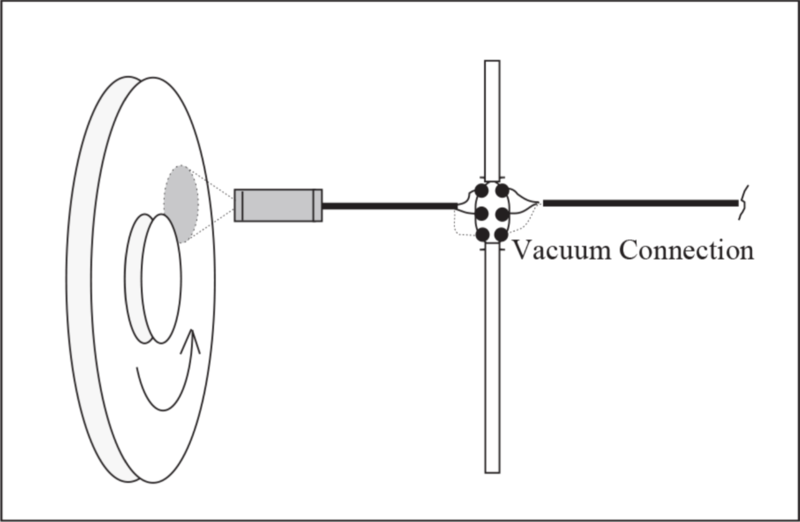 However, the vacuum is not perfect and rotor heating does occur during the test. To properly assess performance, the disk temperature must be known. Standard methods of measuring temperature. such as disk-mounted sensors, using slip rings or telemetry to transmit the data, are clumsy and expensive. The IRt/c can directly measure the temperature of the rotor under full speed conditions. With its hermetically sealed construction, the IRt/c operates in a vacuum without any requirement for protection. Its thermocouple leads can be connected to a standard thermocouple vacuum connector. Test installation design considerations should include IRt/c body temperature and target emissivity. To assure that the IRt/c will remain below 200°F (95°C) even with very hot targets, use a solid metal mounting arrangement to heat sink the IRt/c body, since the internal construction is designed to readily conduct away the radiated heat. For emissivity considerations, a shiny metal rotor disk should have black painted stripes in the areas of measurement. For best accuracy, the IRt/c read-out device can be calibrated to the precise surface conditions by using a Microscanner D-Series.